Salcombe Regis Thorn Park campsite - one of the alternatives to Sidmouth FolkWeek Bulverton's campsite. The Fringe website is here. These pictures are from 28 July 2011, just before the start of FolkWeek. Who says unofficial eye-catching directional signs are not allowed alongside the Public Highway? You'd need to have very poor eyesight to miss these! They were somehow more effective than the Sidmouth design shown below - which was perhaps too 'fussy' in its design of lettering, and thus the readability for passing motorists was degraded. These 'FRINGE' signs were so effective because they were visually uncluttered. The intended USP (unique selling point) is immediately apparent - full marks for design. On the road to the Salcombe Regis campsite you can post a letter or admire some almost worn-out road markings. This should be a 'GiveWay' white triangle on the road - but you'd hardly see it at night. 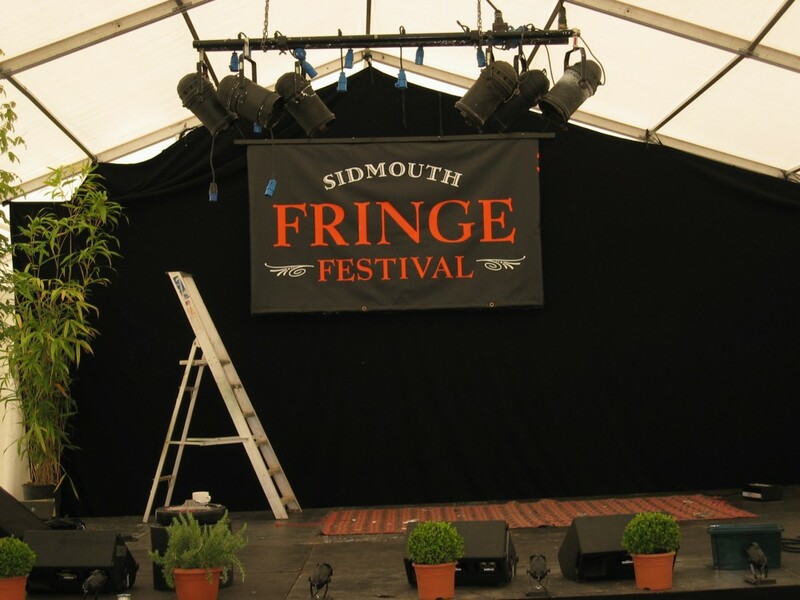 Previously unfurled alongside the A3052, part of the main Sidmouth Fringe sign also serves as a backdrop to their marquee stage. A new form of advertising for FolkWeek 2011 - distinctive yellow and black signs appeared alongside the major routes to Sidmouth. This one alongside the A3052 is a couple of hundred metres from Salcombe Regis campsite. Somehow, when you were driving past, these signs were too 'cluttered' to be easily read. You had to take your eyes off the road and actually read them - whereas the FRINGE message could be assimilated at a glance. Salcombe Regis 'Fringe' campsite, before the mass influx of folkies. This site has one great advantage over Sidmouth's Bulverton site - apart from a few local undulations, it is flat. Ditto - join up the images to see just part of this large expanse of ground. Unlike at Sidmouth - where you can always get your bearings - on this site things look pretty much the same in all directions. After chatting to a few of the early arrivals, I had to search for the way out. The marquee at Salcombe Regis. The site's strength is its campsite - the music is merely an added attraction. At Sidmouth the opposite is true - people tolerate the campsite because of the music and dance that is on offer. 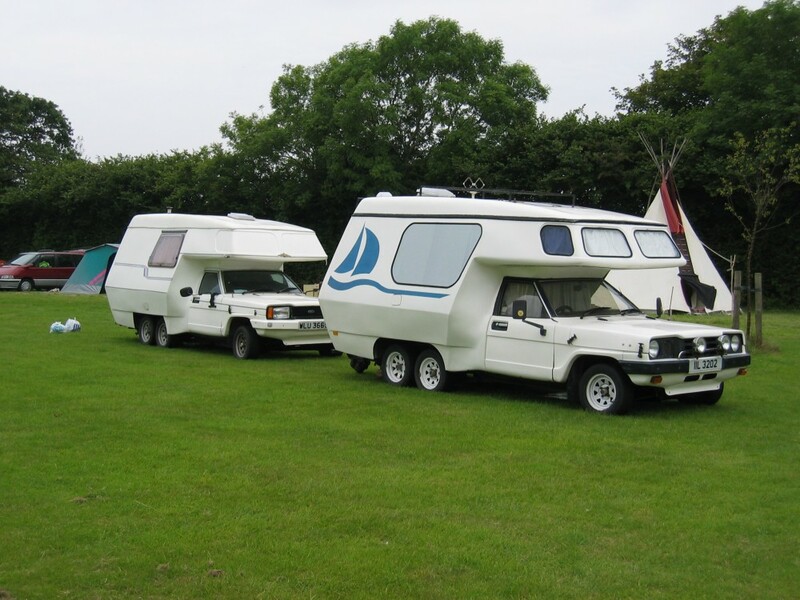 Many people now opt for the best of both worlds - camping at Salcombe Regis and attending quite a few Sidmouth acts. A regular special festival bus service (the ALPHA bus) makes this easy - some people join in Sidmouth town centre festivities along the seafront during the daytime and go back to Thorn Park for the evening. There are no formal dance or ceilidh events. Maybe in a few years' time if the venue continues to grow they might try a small dance floor - but it could never compete with Sidmouth where there are already many dance venues. I was told you could hardly not dance to the Urban Folk Quartet - one of the acts in 2011 - just a pity they were appearing on the same night as the Old Swan Band at Sidmouth's LNE. One of the more unusual of the early arrivals, this is an old gypsy caravan mated to a 1992 Fiat chassis. If you like technical details, the two chassis members were welded together and four wheel braking fitted to the rear wheels to satisfy Ministry requirements before it was issued with a Q plate as a 'one-off' vehicle. Unusually, one rear axle has drum brakes and the other disc brakes. Inside, the caravan is a typical gypsy design - all chrome, white and bling - quite a sight! Anyone fancy manoeuvring this around Sidmouth's Bulverton campsite in the mud? Another unusual campervan - this is a 1978 factory produced Starlight (or similar name?) based on a Ford Cortina Mk 3 with the 2 litre Pinto engine. OK, some of us are old enough to remember taking these engines to pieces in the 1980s. I've moved on a bit since then (but maybe not sufficiently). There was a wide variety of tents and motorhomes - and they were every bit as colourful and unusual as some of those at Bulverton. The following day, a female arrived in full summer plumage. Maybe we'll see some young ones next year?